All the warm weather and the snowpack runoff have Lake Camanche to 84% full. 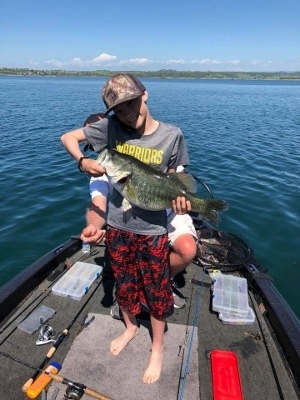 The quick rise in water has made it a bit hard to find the bite but anglers are getting it done as you will see below. 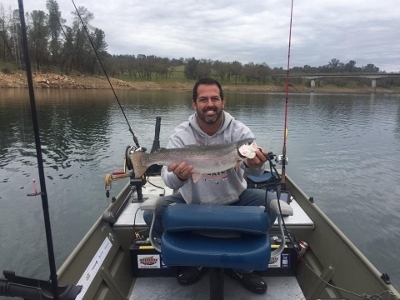 Healthy releases from Pardee Lake has that lake down to 96%. 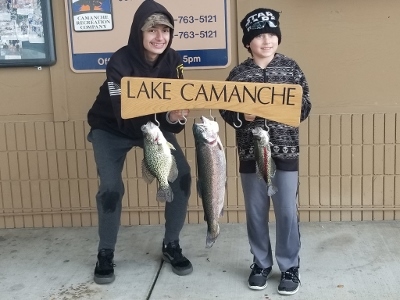 At the time of this report, Lake Camanche had an elevation of 224.96'. Lake Camanche has continued to receive approx. 2,621 C.F.S. from Pardee while beefing up the Camanche release in anticipation of heavy rains and runoff to approx. 2,500 C.F.S. again at the time of this report. This week's trout plant came on Thursday 4/5/18. Mt. Lassen released 1,800 lbs. of trout with 600 lbs. at the south pond and 600 lbs. to both ramps. An additional 3,000 lbs. will be planted before the end of next weekend.